Separation anxiety: all babies go through it, and the tears are usually the worst between 10 and 18 months. The good news is that it’s actually a sign that your baby is well connected to you. Of course that doesn't make it any easier to walk away and leave your baby with someone else when she’s screaming bloody murder! Here are 10 tips for easing those agonizing separations. It might help if you’re able to acquaint your baby early with the babysitters, relatives, and friends who’ll be caring for your little one. Between 6 and 8 months, your baby is likely a friend to all. Getting the caretakers “in” with her now could help make her more comfortable with them when separation anxiety strikes later. 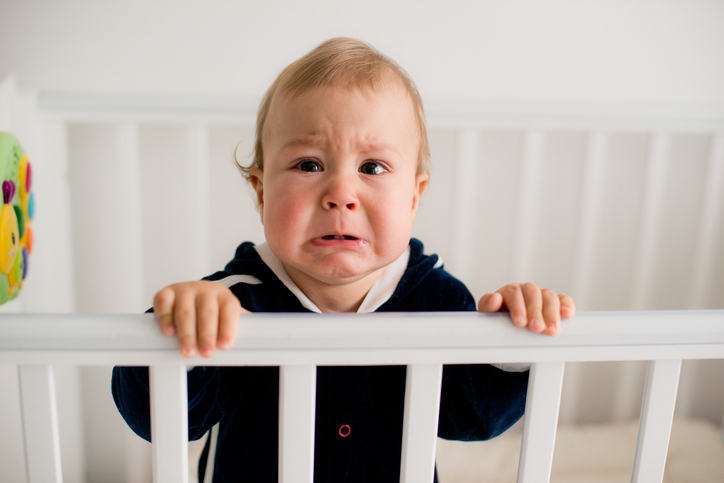 Babies experience separation anxiety because they’re beginning to realize that objects and people are permanent, that they exist even when not in plain sight. Your baby gets upset when you leave her because she knows you’re somewhere, but not with her. To help her understand that you’re always going to come back to her, practice being apart in your own home. Let her crawl out of the room and be on her own for a few minutes (so long as she’s not in any danger), rather than rushing out to be with her. When you have to leave her to run into the next room, tell her where you’re going and that you’ll be right back. Your baby is sure to take your leaving at least a little bit easier if she’s in a good mood when you go. So make sure she’s fed and rested when the babysitter arrives, and try not to leave her when she’s not feeling good. After all, everyone, not just 10-month-old babies, wants their mama when they’re sick. Have your babysitter, even if it’s someone fairly familiar, come over a couple of times to play with your baby while you’re at home. That way they can get acquainted and your baby can become more comfortable with the person. Stay close at first and take things slow, but then gradually remove yourself from the play session as much as possible. Although it might seem like a good idea to slip out without saying goodbye, you really should bid a quick, happy adieu to your babe. Remember that your baby is well in tune with your feelings, so try to suppress any anxiety and guilt you’re feeling about leaving her behind. Instead give her a quick kiss and let her know you will be home soon. Have your sitter arrive about a half hour before you leave, so your baby can get comfortable while you’re still there. This will also give them time to become well engaged in play; ideally your baby will be so distracted with the fun times that you’ll be able to say a quick goodbye and depart without too much drama. Try to keep it short, about an hour, for the first few times you leave your separation-anxious baby. This will help him become adjusted to your coming and going. If possible, avoid starting childcare when your baby is struggling with separation anxiety. If she already attends daycare and is having a hard time with your departures, start a short goodbye ritual that will help her feel more comfortable with the day’s routine. Introducing a special toy or lovey may help. Keep the ritual consistent. You’ve managed to go, now keep going. Returning home and then leaving again will only add to your baby’s confusion and anxiety. It might be hard to believe when your baby is wailing and inconsolable, but those tears will likely stop within minutes of your departure. If not, your caretaker will call you. So kiss your beloved goodbye and try not to feel guilty about leaving your little one in someone else’s good hands.